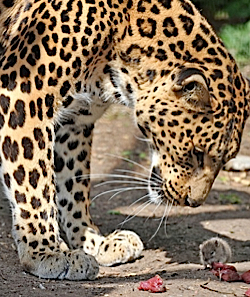 You see, this mouse is very special—he’s my mentor. 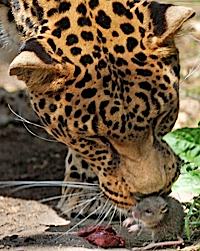 He is a brave soul who is not in the least intimidated or afraid of the hungry leopard breathing down his back. Though he’s being practically mauled by a mouse-eating beast 100 times his size, Bruno has his back turned, and he’s not even paying attention. Fang, on the other hand, is so amazed that someone is not terrified of him, he doesn’t know what to make of this turn of events! When we are following Jesus, we all have the opportunity to be Bruno the Mouse. We have an opportunity to be completely brave and relaxed in the face of the huge, scary, fanged obstacles God puts in our path, believing that God is bigger than our circumstances, and that He’s in control. For each of us, Fang might take different forms, but these kinds of obstacles are always the ones outside our control—difficult places we are forced into. For a friend right now, she is dealing with opposition from her family and having to take a stand on very emotionally charged matters that are very stressful and anxiety-producing for her. Another friend lost his job and doesn’t know when or where the next opportunity will come that he may feed his family. For my mom, it was her cancer, wondering how much suffering she would encounter on the way to her resting place. For me, it is usually something to do with some form of stage or public ministry that I’m pushed onto. Without our “forced Fangs” in life, we would settle for comfortable, but we wouldn’t grow. The encouraging news is that God always wants to move us to the next place where we grow past the fear of this place. With enough practice, those things that were once fear-inducing obstacles become no big deal. We grow and become like Bruno, fearless and fretless in the face of Fangs! Frankly, I’m excited to become more like my little mentor. Life is too short to live in a state of terror. The same God that closed mouths of hungry lions for Daniel, will also close mouths of our hungry Fangs, and we will come out unscathed if we keep our trust in Jesus! Good read, thanks! Maybe you should do a follow up article about this. Many thanks for this info. I’m a little bit more educated after reading this. :). Keep posting, pretty please. Now I’m goind back to my work, the boss is approaching :). Best wishes! Howdy! I could have sworn I’ve been to this site before but after reading through some of the post I realized it’s new to me. Nonetheless, I’m definitely glad I found it and I’ll be book-marking and checking back often! I used to be very happy to seek out this web-site.I needed to thanks to your time for this wonderful learn!! I positively enjoying each little little bit of it and I’ve you bookmarked to take a look at new stuff you weblog post. Thanks for ones marvelous posting! I truly enjoyed reading it, you’re a great author.I will ensure that I bookmark your blog and will come back later on. I want to encourage yourself to continue your great work, have a nice afternoon! Really good blog, thank you very much for taking the time to write the blog.